1. Please don't feed us yet! Spring is coming, I mean really, it has to at some point right? The first rule is don't feed your fish until your water temperature is 50 degrees. If you don't have a thermometer yet, stop by WeekEnding and pick one up. Our fish pets' metabolism is all run by temperature and we need to know what it is at all times of the year for proper care. Even if your fish are swimming to their normal feeding spot on the sunny days and begging, resist the temptation to feed them. When the water is cold, their metabolism is so slow that they do not get any real benefit from the food they take in and most of the nutrients will just go to waste. This waste is just fuel for the algae that is probably already taking over! 2. What if some of the fish are dead or dying? The first thing to do is get them out. You have no idea how many people call the store about this and they say the fish is still in the pond. While it is not unusual to find a casualty or two in the spring, we want to make sure that it does not turn into an epidemic. If there is only one, dispose of the deceased and watch the rest carefully. You can test for high ammonia with a test kit, but often just sticking your nose by the pond will tell you if you need to panic. Ponds with huge ammonia spikes almost always stink. If all seems well, just keep an eye on the fish and try not to worry too much. If there are many deaths or you start to lose a fish or two each day, then it may be time to consider a water change. Be careful, our fish friends are fragile now and we need to not shock them. Your tap water right now is probably only 10-20 degrees warmer than the pond (depending on the source). If we change 30% of the water, you should only see about a 3-5 degree change in the core pond temp and that happening over several hours is still safe. Remember to use water conditioner (we recommend and use EasyPro Water Conditioner at the rate of 1 oz per 1000 gallons) especially if you have tap water. When you do the water change, wait 24 hours and retest for ammonia and noxious odors. If fish are still dying, repeat in two days and call us! 3. Aeromonas Alley and praying for a fast warm up. Spring is a dangerous time for koi & goldfish because of Aeromona Alley. Aeromonas and pseudomonas are gram negative bacteria that are responsible for up to 90% of ulcers in koi. Aeromonas Alley refers to when the water temp is between 40-55 degrees. At those temps, the parasites and bacteria that give koi owners nightmares are beginning to thrive. However, it is also at these temps that our fish find themselves with little to no immune system to defend themselves from such onslaughts. Whoo hoo right? Let's face it. No one really likes to clean their pond. Ok, I do but I am a bit of an odd duck. One the water temps get over 50 degrees, it is time to get things going. Now if you did a great job last fall, this will be easier. There are 2 ways to go about this: either a partial water change or the full drain and clean. I will detail both. First, let's talk about the common elements. No matter what method you choose, now is the time to clean the filters and rinse the media of any mulm & build up. Vacuum up any sludge in the bottom of filter and skimmer chambers and rinse them clean. How are the filter pads, media bags, and skimmer brushes looking? If they need to be replaced, now is a great time. Next, clean out any debris from the streams and waterfalls. There is nothing like turning on your pump only to watch a title wave of black water and leaves come flowing into your pond. If you are not going to do a full drain, then at least do a 30% water change. Given that there is little difference between the water temp in your faucet and pond (use water conditioner), there is very little risk of shock to the fish. While that is happening, you can hook up the pumps and change the UV Bulb to be ready to fire everything up. I prefer the full drain and clean method. Yes, it takes time and is a very dirty job, but believe me, your pond will thank you for it. Get a bucket and fill it 1/3 full of pond water and put your winter aerator in it. 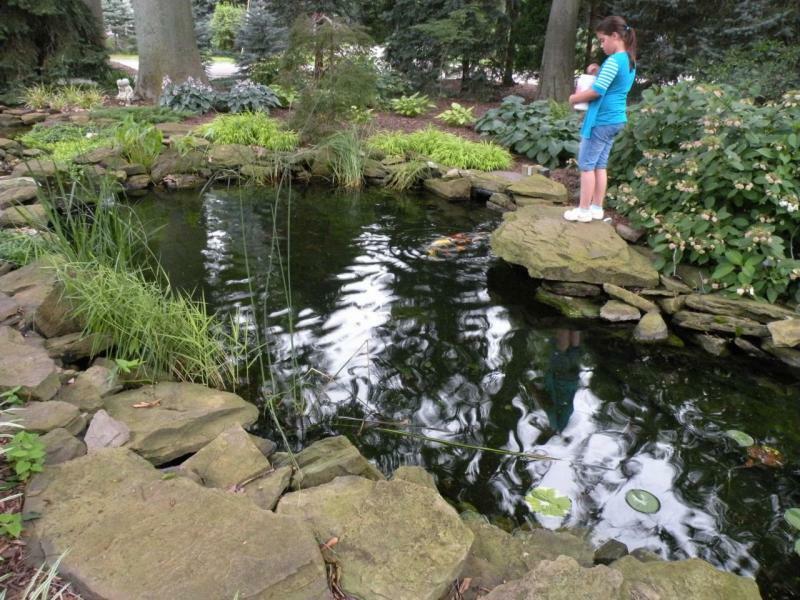 Drain the pond, and as it nears the bottom, start catching the fish (a lot easier with only 10" of water). Once the fish are in an aerated holding tank, put a cover on it as they will instinctively try to jump out. Power wash and clean the whole pond getting out as much junk and muck as you can. Refill the pond (add conditioner) to the operating level and fire everything up. Acclimate your fish to the new water by adding in few buckets of the new pond water to the tank every 20 minutes or so until the temps are within 5 degrees or so and then transfer them back to their new clean home. WeekEnding also provides this service...talk to Zack to get this scheduled! 5. What else do you need for Spring? 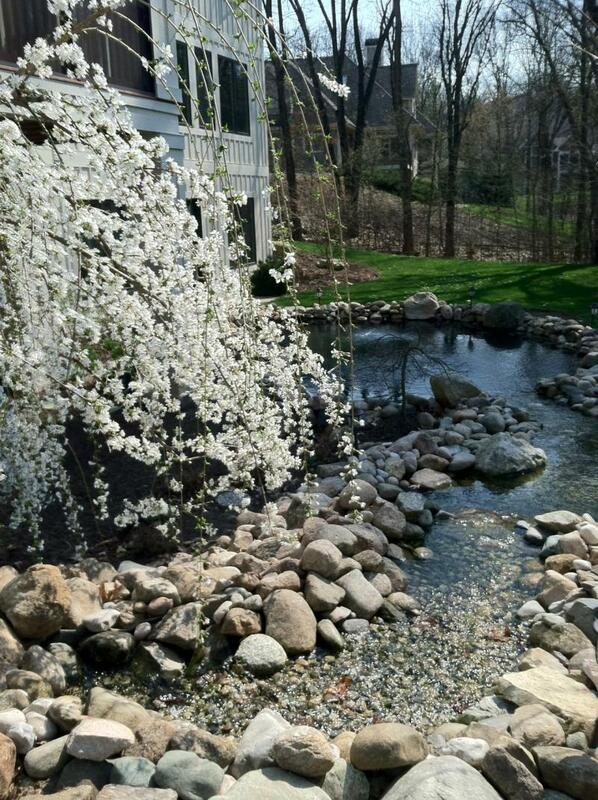 Now is the time to stop by WeekEnding for your spring pond needs. Stock up on Algaecide and Bacteria to keep that now clean pond looking its best for the summer. If you have not replaced your UV Bulb, now is the time. Even if the bulb is lit, if it is more than 2 summers old it needs to be replaced. Also, don't forget to check out our newest koi & goldfish for your pond. On April 26, over 1,000 hand selected fish will be available to choose from. If you have any questions, give us a call at 616-355-5992.